For Brine: In large stock pot, combine sugar and salt. Add 8 to 10 cups of water and stir until dissolved. Place chicken in pot. (If chicken isn't submerged completely with water, add additional water just until the chicken is covered.) Cover pot and place in refrigerator for 24 hours. In large frying pan over medium heat, melt butter. Add lemon slices and cook, turning occasionally, until lemons begin to caramelize and turn light golden, about 10 to 15 minutes. Remove from pan and set aside to cool. Using paper towels, dry chicken thoroughly. Using fingers, carefully separate the skin from the flesh of the chicken by running fingers over breast and thigh. Do not tear skin of chicken. 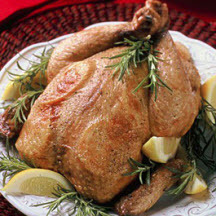 Insert lemon slices underneath the skin of the chicken, placing them over the breast and thigh. Place rosemary inside the cavity of the chicken. Brush chicken with olive oil and season outside well with remaining salt and black pepper. Place chicken in oven and bake until it begins to take on color, about 15 minutes. Reduce heat to 350°F (175°C) and continue to cook until juices run clear when a skewer is inserted into the thickest part of the thigh, or until meat thermometer registers 180°F (82.2°C), about 1 hour to 1 hour and 20 minutes more (depending on size of bird). Nutritional Information Per Serving (1/4 of recipe): Calories: 600; Total Fat: 40g; Saturated Fat: 12g; Total Carbs: 2g. Recipe and photograph provided courtesy of the National Chicken Council. Used with permission.